Greetings: painters, wargamers and curious travellers! As promised on my last post, here is the tutorial for the Éomer (on foot) miniature. 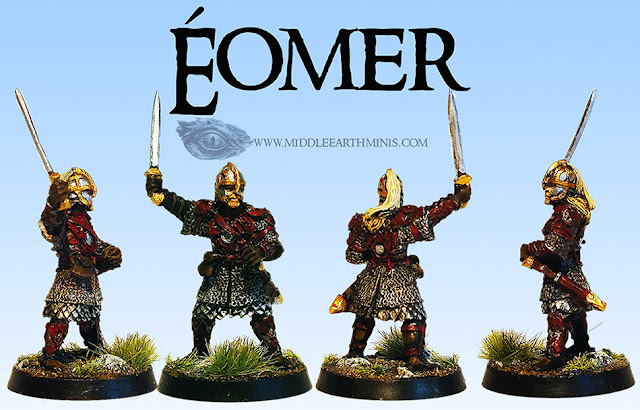 This model came with the Battle Games in Middle Earth 64th issue, and it's the exact same "Éomer" that came with the number 18. "Northman, prince of Rohan. Born in 3019 of the Third Age, Éomer was the nephew of King Théoden of Rohan, and like nearly all of his race was tall, strong and golden-haired. Before the War of the Ring, Éomer was a marshall of Riddermark, but through his friendship with Gandalf and his concern about the evil influence of the king's adviser, Grima Wormtongue, he fell out of favour. During the War of the Ring he fought with distinction at the battles of Hornburg, Pelennor Fields and at the Black Gate of Mordor. When King Théoden received mortal wounds on Pelennor Fields, he named Éomer his heir. He became the eighteenth king of Rohan and ruled until the year 63 of the Fourth Age. In 3020, he married Princess Lothíriel of Dol Amroth, who soon after bore his son and heir, Elfwine the Fair." Source of image and description: David Day, Tolkien, the Illustrated Encyclopaedia. I found a great challenge while painting this model. Partly due to all this months I've been without painting, but nevertheless, this is no simple task. But mainly because of his armour, that has silver parts beneath the red leather surface, which makes way enough for a nice challenging afternoon. I have decided to prime it black. The basecoat of Éomer's armour was done with the Army Painter's Plate Mail Metal. Make sure you paint the internal parts of the chest and back plate. Following a wash of Nuln Oil, comes the part that will distinguish the mail from the scales: the mail parts are drybrushed with XV-88, and the scales are offered a shiny finish with AP's Shining Silver. Finally, a light drybrush was given to the mail. This is the trickiest part of the miniature. Be sure you focus the right parts of the armour. 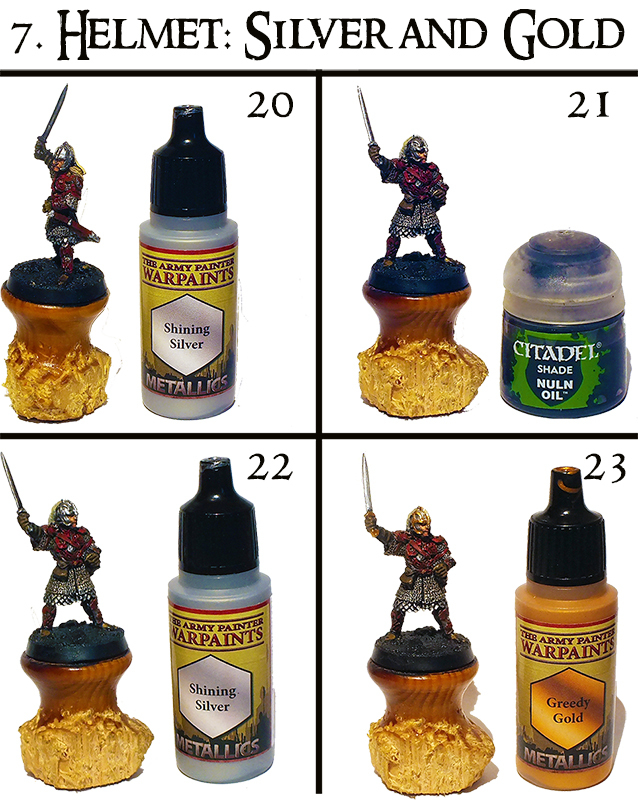 The basecoat was done with Dark Flesh (Doombul Brown nowadays), the highlights with Mephiston Red, and the Agrax Earthshade was used for glazing, so be careful with the quantities you use. We don't want to "pool" these parts, just to glaze them. Basecoat with Rhinox Hide, Highlight the edges with XV-88 and Glaze all the leather with Agrax Earthshade. Cadian Fleshtone and Vallejo's Basic Skintone and Fleshtone Shade. Be careful with this very confined surface. The aim of the highlights are the cheekbones. 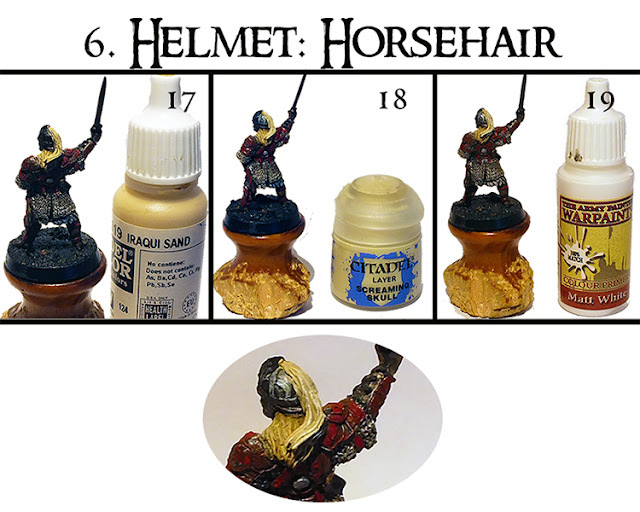 For the characteristic "Golden-Hair" of the Rohirrim, I've started to basecoat with XV-88. 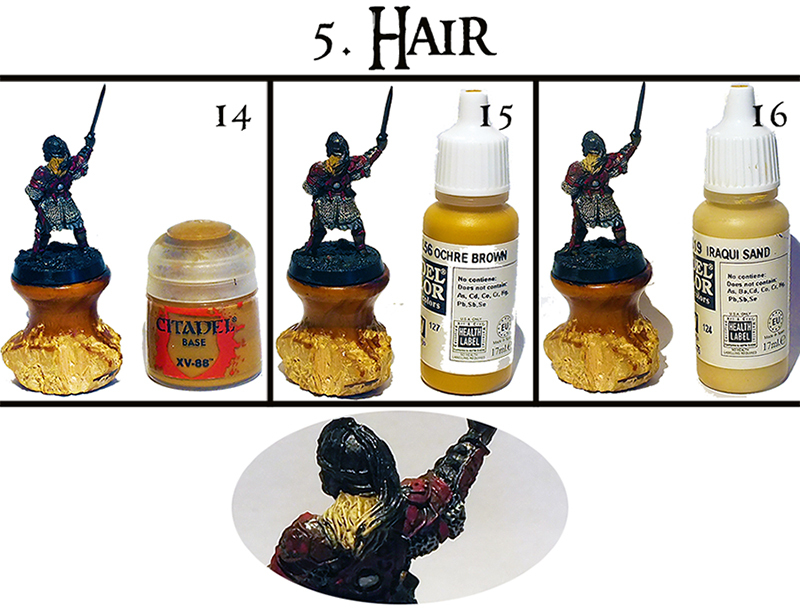 The following step is done by picking every strand of hair that the miniature has with Vallejo's Ochre Brown. Finally, I gave it a light drybrush with Iraqui Sand. 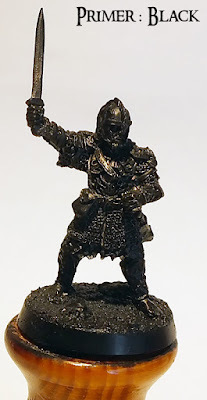 Éomer's beard is done the same way, but I've decided to do it as the final step of the whole miniature, as it is a job that requires more precision. For this one we intend to give a distinctive tone to the horsehair on his helmet, so the decision was to make it lighter. The steps are the same as for Eomer's hair, but with lighter tones: Screaming Skull and Matt White. The helmet part is fulcral! It gives this model his whole character. So, for this step, I've worked only with bright metallics. Basecoated with Shining Silver, shaded with Nuln Oil, and highlighted with Shining Silver again. The Greedy Gold was applied to the relieved parts of the helmet with a great amount (the most I managed to gather) of attention and steady hands. The same steps were done on the sword. Finally, to make the helmet pop a bit more, I applied Bright Gold to all the details of it, and I think it made all the difference. 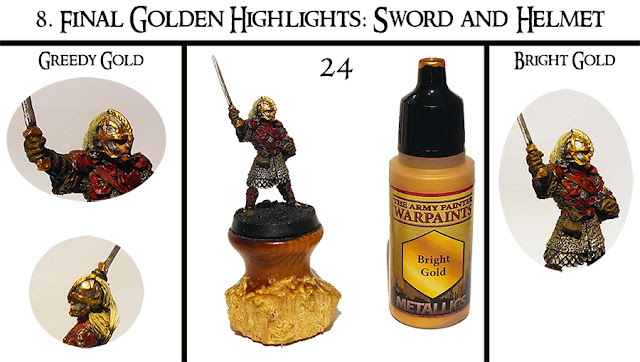 I was already an enthusiast of their metallics when I got their Plate Mail Metal. 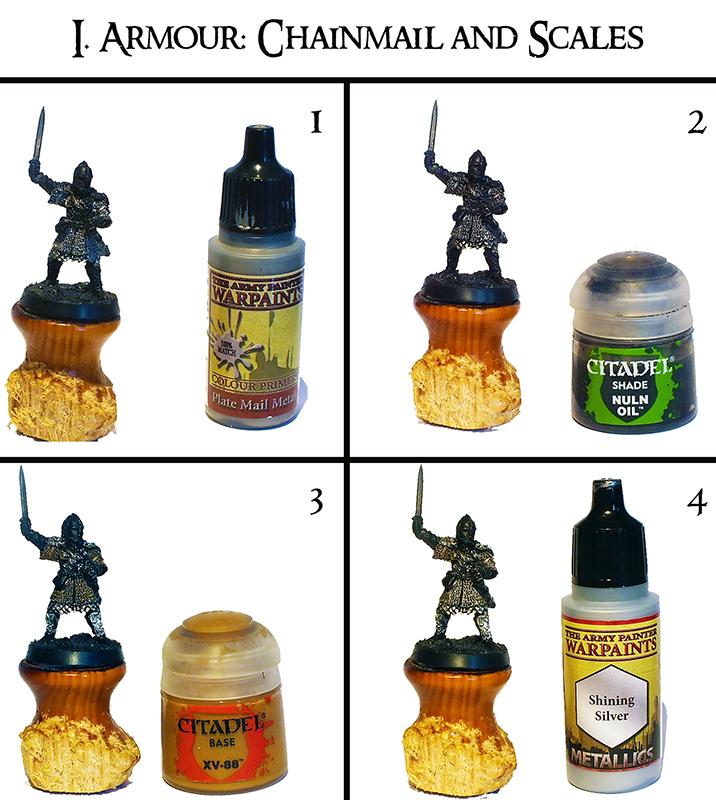 Well, after I bought AP's whole metallic range this week, I couldn't be happier and eager to try them... has you can testify, the results really are astounding and I can tell you that the painting session provides a fair amount of joy to the artist. If you haven't tried them yet, I really recommend you all to do so! You wont regret it for sure! And like this, another mini was finished. An absolute joy to paint, as well as a good challenge to my capacities. Have a great week! And keep on Hobbying and Wargaming! 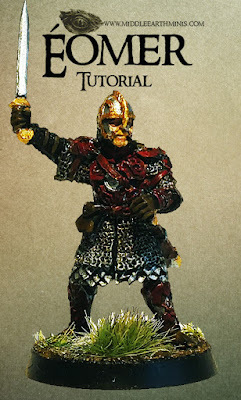 Excellent paint job and tutorial. Thanks for your comment Ross! Great painting and a very educative tutorial! Thank you for the feedback George! Now for wrath, now for ruin, and the world's ending!!!!! Looking really awesome! Thanks for a tut!